I don’t remember where I read about Adele by Leila Slimani (I should be using Sarah’s Bookshelves’ recommendation source tracker! ), but I found it somewhere and added it to my TBR a few weeks ago. It’s about a mid-thirties woman named Adele who lives in Paris. She’s a wife and mother who is deeply dissatisfied with her life and seeks out affairs and sexual liaisons wherever she can. These interludes are unemotional and leave her numb, yet she can’t stop herself from pursuing them and putting her marriage, health and comfortable life at risk. While there are aspects of Adele that are relatable, such as the myopic world of motherhood and the loss of identity many women feel as they approach middle age, ultimately Adele herself as a character was hard to connect with. She is selfish and self-centered, yet also fearful and anxious. She doesn’t care at all about her job as a journalist, and uses her friends solely as coverups and alibis to facilitate her double life. While I kept reading because I wanted to see how things resolved for Adele – would her husband discover her life and would he kick her out?? – the book has a coldness to it that makes it hard to connect with. 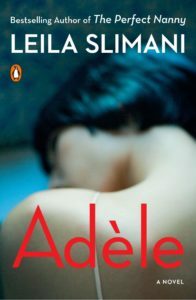 I enjoyed Slimani’s writing (the book is translated from French) but in the end, Adele didn’t leave much of a mark. Goodreads reviews are all over the place – some people loved it and found Adele’s search for identity and purpose fascinating, while others found it dull. In the end, I just found it kind of depressing.